Color(s): Pure White-no color markings with black pigmented nose leather, lip and lid edges, dark footpads. This working breed originated during the 1600s in Poland as a herding dog and as a guardian. The Polish Tatra Sheepdog nearly became extinct during World War II, but was re-established by the Polish Kennel Club. This breed is considered to be one of the rarest dogs in North America. The Polish Tatra Sheepdog is massive and imposing. Their weather resistant coat makes them capable of withstanding harsh, cold temperatures as well as dry, hot climates. This breed is highly intelligent and independent. They are extremely agile, alert, and lively. Polish Tatra Sheepdogs are a proud and loyal companion. Faithful and deeply devoted to their master and family, the Polish Tatra Sheepdog thrives on human companionship. They are typically very gentle with well-behaved considerate children and other pets, although they will attempt to use their herding abilities on anything and everything that moves. This breed is exceedingly protective of their home, family, and territory. They will bark loudly at suspicious noises or anything unusual, and are generally wary of strangers. They will bite if challenged. The Polish Tatra Sheepdog is not recommended for the novice dog owner. The Polish Tatra Sheepdog requires daily brushing and combing to minimize loose hair. Special attention should be given to the coat during the heavy shedding periods. Bathing or dry shampooing should be done when necessary. Weekly cleaning of the ears and teeth is a must. 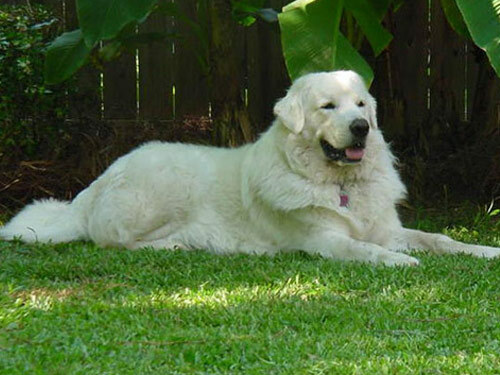 This breed is prone to hip dysplasia, juvenile cataracts, bloat, epilepsy, and patella luxation. The Polish Tatra Sheepdog is a double coat breed. The outer coat is straight or slightly wavy and is harsh in texture. The under coat is dense and profuse. The color of the coat is pure white with no markings. This breed is an average year round shedder that sheds its under coat twice a year. This breed requires early and lifelong socialization training. Basic obedience is absolutely crucial. The Polish Tatra Sheepdog does not respond to harsh or heavy-handed methods. It is imperative they have a strong alpha leader who uses firmness, fairness, consistency, and respect. As a working breed, the Polish Tatra Sheepdog requires daily exercise and thrives on being given something to do. They enjoy family play sessions or any family activity in which they are included. They are not suited for apartment dwelling or small yards. The Polish Tatra Sheepdog does best with acreage where they are able to romp, roam, and run freely and safely.